Our lifesize standees will turn heads and wow vistors in equal measure! They are also the perfect focus point of any themed party or perfect gift sure to delight the most avid fan. All standees are designed self supporting and assembled within seconds. Alternatively it is possible to leave the supports flat and wall mount the standee as you wish. All standups can be folded up for easy storage. All Cardboard Cutouts are 2D and manufactured and couriered from the United Kingdom! INCLUDES STAR PHOTO! 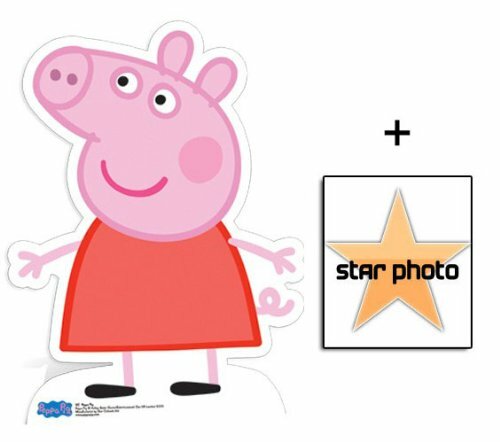 UNIQUE to Starstills, with your cutout you get a generous 25x20cm gloss finish photograph of Peppa Pig professionally produced and printed on premium, top end crystal archive quality Fujifilm photographic paper. If you have any questions about this product by Starstills UK Celebrity Fan Packs, contact us by completing and submitting the form below. If you are looking for a specif part number, please include it with your message. Chinese Sky Lanterns White Paper (10) Pack - Ready to Use and Eco Friendly - Extra Large - 100% Biodegradable - Beautiful Night Sky Lantern for Weddings, Chinese Festival, Memorials, etc.